It is so great. Nothing happens ever! You think something is about to happen but then any hint of conflict resolves itself. It's a very relaxing anime, I am pretty sure there is an adolescent boy that goes to their same highschool that is repetitively saving our universe from certain destruction, but he is not the focus of this anime apparently. This looks like a slice of life with a cast made up largely of high school girls, making their way through the various things that life throws at them. The direction they are going to take this looks to be a pretty relaxed approach at school life, but they do throw some teasing elements of yuri around the edges played as being very friendly. It is a coed school, but the girls are the near exclusive focus of the show. The beginning is fairly cute and easy going as an introduction of cast, and they will likely just stick with light and cute. Though they do seem to be trying to take a thoughtful approach to some of the issues that come up in the life of a teenage girl, as shown in episode 2 about weight and dieting. Overall there are light single episode plots that deal with day to day life, and generally an easy going tone to the series suitable for any age. Our initial MC is skilled in rhythm gymnastics, and getting ready for a competition, but it looks to be doing a round robin with different episodes focusing on different girls in the group. Though the first episode ends up being far more focused on the girls interacting with each other, and that will likely be the general trend through the series. A couple of the girls have a stiff speech pattern, but that is likely due to being foreign exchange students. They are very mild mannered in their tone as they speak as well, so that adds to the expectation that it will be a gentle slice of life type of show for feels. This show is really a Moe slice of life show. Not that that is bad and I did rather enjoy it. I would say its biggest failing is that it has far too many characters to keep tabs on. As all the characters are cute girls the whole thing blended into a sort of "Moe soup" by the end. However, still worth the watch if you like Moe slice of life shows. If you are looking for romance, action, or really anything else then this may not be what you are looking for. So let me start off by saying that so far, I've watched about 50 anime, and never have I stopped watching one. If I don't like the first episode or so, I give it time to prove itself, and every single one has proven me wrong and I end up loving it...except this one. This one will be the first one that I quit watching. It is incredibly boring, and doesn't contain a cohesive story. The main focus of the first two episodes ends up not even being a main character, and instead of going with a solid story, they focus on single episode plots. If you like this kind of single episode, slice of life stuff, you might love this. But be warned that the title is misleading because there is no dating (as of yet, and I won't find out), and the only guys you see are in the backdrop, and if I recall correctly, not a single one has spoken. It all focuses on the girls, and there are many hints, some heavier than others, of yuri undertones. I expected something cute and relaxing, but this is just too much. After 4 episodes, I can't stand it anymore. But that's just my personal opinion. It's a show about high-school girls going about their lives as high school students, in normal and uninteresting ways. The yuri fanservice hinting pretty much disqualified any hope I had for this anime, although considering it's based on a dating sim, I didn't have high hopes for it anyway. It's about as generic as it gets, it gets shelved with other such shows like yuru-yuri... which might be more interesting just because of the comedy. This, however, is a solid 3.5/10... just too many school-life anime and not enough good ones produced to keep up with the supply of garbage. Which is sad, because neither this nor that had any plot to speak of, really. Obviously the title says it all, the show is about a bunch of Japanese schoolgirls and their hobbies, each new episode brings new characters with new personalities and interests. cute asf but so many characters. Love this anime... art is cute, voice actors are well done and the idea is great... but its a little to involved with too many characters, and climaxes aren't met with result just assumed happy endings or imagery/symbolism to show a happy ending which is where this anime falls short. Still very please and was a nice calm anime to watch. I'm about halfway through the series, so take that as you will, but the show seems to have found its stride by now. This is a series about schoolgirls going through everyday life, meeting friends, and worrying about little things before having those things get resolved by the end of the episode. When I first started watching this series, i kept commenting that it had a positively huge cast. A few more episodes in, I eventually realized that that's because each episode really focuses on a different character, and usually a different group as well. It feels like if they took a single group and extended out a series just about them, it would make for a really nice experience. As it stands, though, the fact that I don't really need to keep track of who's who between episodes makes for a very relaxing watch. It's pleasant, but likely won't make a lasting impression. I kinda feel like it's a shame, but I also like what I've watched so far, so it's probably a tradeoff. Also it's notable that there's a character in here who deliberately speaks in a stilted accent because she's an exchange student. It's not something I'm used to seeing, and I like that touch. EDIT: I just finished the last episode, and it looks like about two-thirds through the series, they stop introducing new characters and just have them interact in different groupings. To give some perspective to the size of the cast, I'm pretty sure that this photo from the last episode - http://imgur.com/rDCuGEX - is the entire named cast of the show. Everyone in that image is given a name and personality over the course of the show. To be honest, I've started to see it as a different take on the slice-of-life/sitcom setup, where you can experiment really frequently with just setting up different personalities side-by-side without having to invest in building the character further. The other main points from my earlier review stand as-is. A show that is exactly what you would expect from the picture, an adorable and easy to watch show about cute girls! 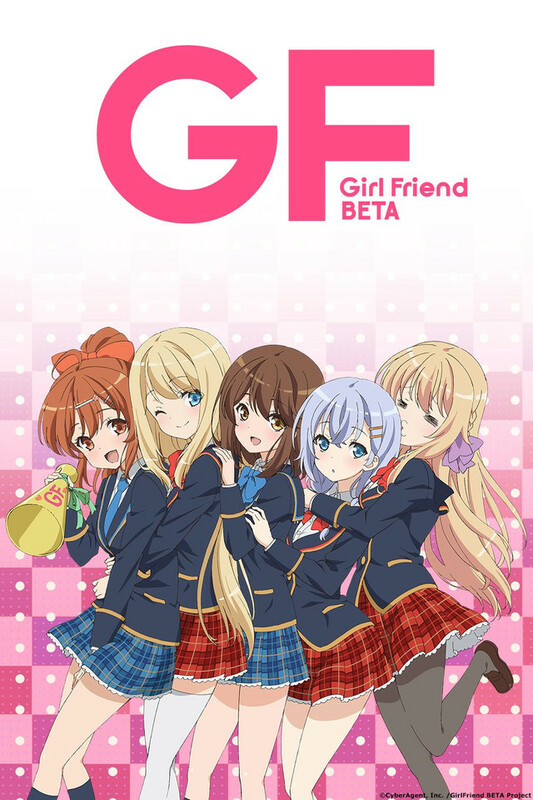 Girl Friend Beta is a Slice of Life, Comedy, High school moe show. It follows the genre to the book, cute girls doing activities together before, during, and after school. The story in slice of life school anime is usually hard because it’s usually the cast of characters going about their lives tackling different daily challenges. The story of Girl Friend Beta is especially hard to pin point because there really isn’t a single main character. At first it seems as if a girl named Kokomi Shiina is going to be the main character as she stars in the first couple of episodes, but quickly the show starts to feature many different girls as the main characters in different episodes. Each episode ends up telling a cute story about one the girls and I really enjoyed this formula. It made each episode unique and I was really excited to get to know the featured character better. All the characters are very lovable, the one thing I should warn anyone interested in watching this show is that the characters although lovable, are all lovable in a cute way. The characters themselves aren’t deep and many of them are simply Moe. Don’t expect character development or complicated relationships between the characters. The stories told themselves are the usually slice of life school stories, about festivals, clubs, after school activities, sleep overs, and etc. This show doesn’t break any barriers of the genre, but all the genre clichés well. All the main characters are girls and although there are some rare and brief appearances from males, males are a non-factor in this show. Just something to keep in mind. FINAL VERDICT: This show is exactly what one would expect it to be, a show about cute girls going to school together and filled with cuteness! If you aren’t a fan of the genre, this show isn’t going to change your mind because it follows the genre to the book. If you are a fan of this genre, this show will give you what you want.